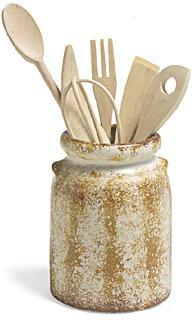 Everyone loves hand painted ceramic and glass. If you have clay in your back yard, all the better! Getting into ceramics and pottery is a real commitment, but with good taste, the rewards are breath taking. 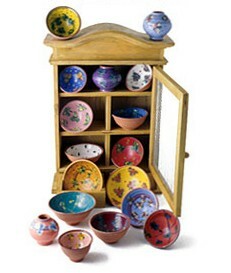 The pottery to the left facilitates the use of contemporary shapes and bright colors such as bright yellow with pink. Recently at a craft show we saw the most beautiful hand made tiles that were 3D in effect. It was enough to make a person want to redo their entire kitchen and bathroom. A few tiles had the broken mosaic look with a half of a cup protruding. As we get into the world of pottery, making hand made tiles is most likely the easiest learning curve for us and if the patterns come out right, one we can use to actually revamp our kitchens. Making our own tiles, we can save tons of money and still have that very rich look. It can't be that hard and we are game! We also decided, as an alternative to the time consuming two bake process we could use the same sponge ware techniques described below which allows you to paint simple white tiles, anyway you like, and simply coat when done with a two coat Delta glaze. If this is OKAY to use for food service, it must be fine for making your own hand painted tiles. Home Depot sells plain white and bisque colored tiles for about 30 to 70 cents each. This would be a great project for kids! Who knows what designs they may come up with. We are going to try to plaster broken coffee cups onto our designs and then coat them. You could make a splash board for your kitchen, cut out one whole section of counter and replace with the tile, mount four of them to make one wall hanging, and so much more! An Easy Weekend Project: Hand Painting Glass. Years ago I saw the hand painted wine glasses that came with Perrier-Jouët Cuvée Belle Epoque Vintage 1989 and thought they were so beautiful. I ran out and tried to paint some for my home but the art work was no where near as good. I since found out you can just tape a photo inside the glass up against where you would like to paint and follow that! 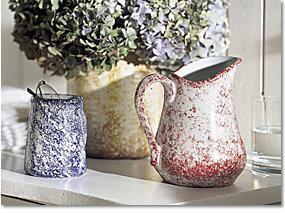 Be sure not to wash your creations in the dishwasher and use a paint acceptable for painting glass. Click thumbnail for more detail. Blue and white spongeware won the hearts of American homemakers in the 19th century, but the sponge-decorated pottery's most popular color palette was by then no newcomer to Western shores. One of the more rustic forms the color combination eventually took was created with pigment-saturated sponges that left charmingly mottled impressions. While antique pieces can cost as much as $800, you can create your own spongeware for a fraction of the cost with inexpensive white ceramics. With these simple instructions, you'll have a prized "antique" that's all your own. (found in craft stores) along with random splotches to customize a set of bowls. and sponge again along the edges. closely related shades of one color. When choosing sponges, pick ones that have different-sized cells for a varied design. If using a sea sponge, cut it in half for a flat surface. To get variations in light and dark designs, vary the pressure when applying the sponge. To create an antique look, use two shades of a similar color (we used Cape Cod Blue with Navy Blue and Dark Goldenrod with Burnt Sienna). Or, lightly sponge a neutral color, such as Khaki or Mushroom, as a first coat to age the whiteness of the china or as a final coat to soften and age the colors. Note: Before beginning this project, it is important to read and follow the instructions provided with Delta Air-Dry PermEnamel products. 1. Before sponging, condition each piece with Air-Dry PermEnamel Surface Conditioner as directed. Let dry. 2. To sponge an all-over pattern, cut a flat surface from a sea sponge. For a particular shape, cut out the shape from a cellulose sponge or find precut soft stamps at your local craft store. 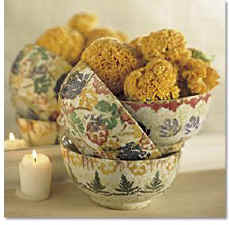 Stick with simple patterns and country colors because this is what gives spongeware its easy, do-it-yourself appeal. 3. Brush paint onto the sponge. 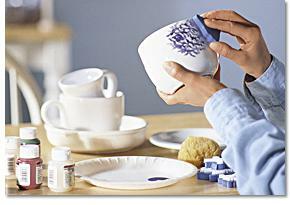 Press sponge onto paper towels to remove excess paint, then sponge paint designs onto the ceramic kitchenware. For a primitive look, be random in your placement of the sponge. Blue is the most recognizable spongeware color, but almost any color can be used. 4. Allow the sponged paint to dry at least one hour, then apply two coats of Clear Satin Glaze, allowing each piece to dry one hour between applications. For a shiny finish, use Clear Gloss Glaze. 5. Wait 10 days before washing to allow the painted design to cure. After this time, pieces are dishwasher-safe.